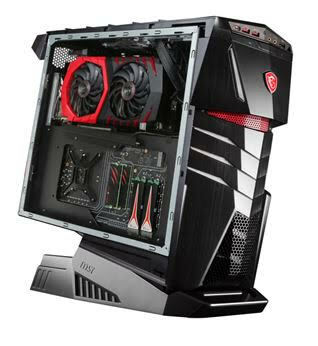 MSI has updated its gaming desktop computer line up at CES 2017, including Aegis, Nightblade and Trident, Implementing the latest Intel Kaby Lake processors, MSI’s renowned GTX 10-Series GAMING Graphics Cards with Twin Frozr VI technology and a refreshed design with a touch of carbon, MSI puts a ready-to-game desktop family in the market. Over at MSI’s booth, Tinhte.vn is reporting their find and pair of Plextor M.2 SSDs M8PeG in the display model of Aegis Ti3. MSI’s flagship Aegis Ti3 features two GTX 1080 GAMING 8G in SLI setup and an Intel Core i7-7700k CPU. It will support up to 3 x M.2 NVMe PCIe SSD with one slot supporting upcoming Intel Optane modules for SSD caching. Plextor gaming-minded M.2 SSD M8PeG is powered by the latest NVMe protocol. It boasts of extreme performances up to 2500/1400 MB/s sequential read/write speeds, and up to 270000/150000 IOPS random read/write performance. Even with games that require heavy read/write operations and intense graphic processing, it delivers the smoothest gaming experience with its powerful infrastructure optimized for eSports. The Plextor M8PeG comes with TrueSpeed, TrueProtect, and LDPC features. The TrueSpeed technology keeps long-term SSD performance at like-new speeds after periods of use and when the SSD is nearly full. The TrueProtect technology is a multi-layered error checking mechanism automatically executed by the firmware. By employing the error-correcting capability of ECC, it can correct up to 128 bits of random errors and in conjunction with the Plextor exclusive real-time debugging mechanism and the self-testing capability of Flash, TrueProtect keeps data access error-free. The LDPC technology guarantees data accuracy and SSD reliability.